What is a passive crossover ? Before we get deep into the passive crossover design, let’s start by splitting the crossover network into 2 kinds : active crossovers and passive crossovers. A crossover, regardless of its kind, will take the signal and split it into different frequency intervals or bands, and each band is routed to the appropriate speaker. For example : if you have a 2 way speaker, the crossover will route the low frequencies to the woofer and the high frequencies the the tweeter. See Fig 1 for an example of a 2 way crossover. Same applies if you have a 3 way or more system. The crossover will split the signal into as many bands as there are speakers. More speakers, means shorter intervals, and each speaker works with a narrower frequency range, thus a little less effort on each driver, for a multi-way setup. Passive crossover means that the signal is split after it is amplified by the amplifier. For this reason, it has to deal with large currents and voltages. Active crossover means that the signal is split before it reaches the amplifier. Which means the crossover works with a low level signal, but for each driver of the system a separate amplifier channel is needed. It has many advantages versus the passive crossover, but it is more complex to build and requires more amplifier channels to drive the system. While the passive crossover has fewer components, it is more difficult to design. There is more to it than just splitting frequencies. The crossovers need to correct some frequency response imbalances of the drivers, the roll-off slopes need to be on point, so that the transition between low and high frequencies, at the crossover point, is done as flat as possible, with no response dips or peaks, phase corrections etc. Nevertheless, a crossover will make or break a high quality speaker. For the rest of this article we will focus on the passive network. Although it has its disadvantages, it is more convenient and more widespread. Band pass filter : Filters some low frequencies and some high frequencies. Used for midrange drivers. Low pass filter : Filters the high frequencies and lets the low frequencies pass. Used for woofers. This describes the frequency where the component reactance are equal. It is the actual crossover frequency / crossover point. The formula which dictates the crossover frequency is dependent of (L x C). If you give different values to L or C, but their produce is the same as before, the crossover frequency remains the same. These names should be remembered, because they are mentioned in passive crossover descriptions. For example : LR4 means a 4th order Linkwitz – Riley crossover. Pass band (orange line) describes the frequency on which the crossover does not interfere. It lets these frequencies pass. While not shown in the graph, but using analogy and common sense, another pass band is present for the high pass as well. Crossover point (yellow dot) : The point where high pass meets the low pass. In a practical example : if the crossover point is at 500 Hz, the woofer will receive 20 – 500 Hz and the tweeter will receive 500 – 20 000 Hz. Slope (brown line) : The amount of attenuation per octave, starting from the crossover point. In our case, for each increasing octave, it looses 12 db of output. Judging by our graph, let’s say the crossover point is at 350 Hz. Let’s say the woofer is 90 db loud at 350 Hz. Because of the crossover attenuation and the 12 db slope, the woofer will be 78 db loud at 700 Hz, 66 db loud at 1400 Hz and so on. You must be looking at this graph and being like : Wait a minute !? What’s with the dip at the crossover point? Shouldn’t the frequency response be flat ? Yes, it should, and it will be flat, if the crossover is made correctly. Let me give a practical example on our graph : Lets’ say the woofer is 90 db loud at 20 Hz and plays alone at this frequency. The tweeter is 90 db loud at 4 Khz and plays alone at this frequency as well. At 350 Hz (the crossover frequency), the woofer is 84 db loud and the tweeter is 84 db loud as well, but they play both at the same time. When 2 sound sources play the same sound and are in phase, it will combine for a +6 db louder sound. So, the woofer compliments the tweeter at the crossover point to make a smooth transition and yield a flat response (of 90 db). To choose the correct crossover point, so that the sound system will be flat, phase is a determining factor. Phase is important because when the sound of speakers add up, they do in different ways according to phase. If two speakers play the same sound and are in phase, they will combine for a + 6 db sound level increase. But what happens when the 2 are out of phase ? 90° out of phase : When 2 sources are 90° out of phase, they sound like they are producing different sounds. This will add up for a +3 db sound increase, so 93 db of total output. Imagine 2 people shouting at the same level but shouting something different. They will sound louder together, no ? 180° out of phase : When 2 sources are 180° out of phase, they will cancel each other out, so 0 db of total output. If you reverse the polarity of the out of phase speaker, it will be in phase and this will result in +6 db of sound output, for a total of 96 db. 360° out of phase : When 2 sources are 360° out of phase, it’s the same as they would be in phase. This will add up to + 6 db of sound increase. Why is this important? Because using different types of crossovers will result in different phase relationships between the drivers. So if the drivers are 90° out of phase, the crossover point needs to be -3 db. When the sound of the woofer and the sound of the tweeter combine, it will result in a flat response. If the drivers are 180° or 360° out of phase, this means that the crossover point needs to be -6 db, to get a flat response from the overall sound system. All of the information we just talked about doesn’t take into account the positioning of the drivers. We are assuming that the drivers radiate sound from the same spot. This does indeed happen for coaxial drivers, where the tweeter is mounted on a pole in the middle of the woofer. This way, the sound from both speakers come from the same acoustical center. In most cases, the woofer is separated by the tweeter. Usually, the tweeter is on top and the woofer is on the bottom, with some distance between them. This vertical separation creates some problems. At the crossover point, where the frequency response of the woofer overlaps the frequency response of the tweeter, it could create some time delay and phase distortion. To minimize this issue, reduce the distance between the woofer and the tweeter as much as possible. However, knowing what the crossover frequency is, you can find its corresponding wavelength at that frequency (in meters). Make sure the distance between the two drivers is not longer than that. Another thing to take into account is the horizontal separation. 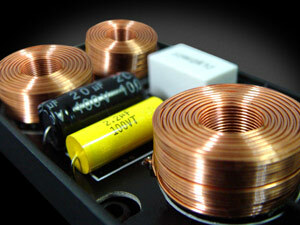 The acoustical center of each driver is considered to be in the middle of the voice coil. The voice coil is sitting right in the magnet assembly. Imagine how shallow a tweeter is and how deep a woofer is. For this reason, it creates an horizontal separation between the acoustical center of the woofer and the acoustical center of the tweeter. Even though the tweeter is on the same baffle as the woofer, it is actually in front of the woofer, acoustically. To correct this, you can use an asymmetrical baffle, to place the tweeter a little bit back, so the coil of the tweeter is on the same plane as the coil of the woofer. These distance differences should be taken into account when designing the passive crossover network, as it can correct them or make them worse. In conclusion, the placement of the drivers and the phase behavior of each driver should not be neglected. This article does not tell you how to build a crossover or what are the physical components of such device. The crossover is a vast subject and this article is only trying to cover the basics of the passive crossover. However, in future articles we will tackle this subject in depth, with instructions of how to build different types of crossovers as well. Introduction to Loudspeaker Design: Second Edition by John L. Murphy (True Audio, 2014).